The Gun Rights Hall of Shame recognizes those individuals who have done the most to dishonor the fundamental civil right guaranteed under the Second Amendment to the Constitution of the United States of America, and Article I, Section 16 of the Constitution of the State of Maine. Representative Casas is the sponsor of LD 1154, a bill which would create a "voluntary" (for now) registry of gun owners. A dangerous bill, which will only serve to identify gun owners to the government, LD 1154 will accomplish nothing at all, because few if any will be foolish enough to ask the government to place their name on a list of gun owners. Rep. Casas knows this, because it has been explained to him at great length. He doesn't understand, or he doesn't care. Owen Casas is a man who should know better. 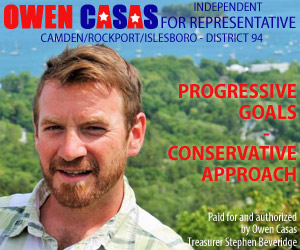 "Progressive Goals", his campaign ad reads. We agree.